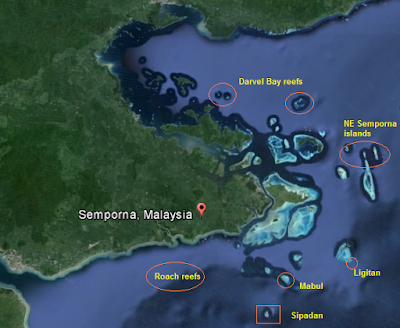 Sipadan has unique geography and location. BUT the sharks, turtles, fish and other biodiversity can occur in other places. With this roadmap, Sabah could have many areas with as much tourism potential as Sipadan. These are still being eaten! Tourists come to Sipadan to be wowed by amazing fish, sharks and turtles. All tour operators compete for Sipadan permits. More permits or alternative great dive sites would enable the industry to expand. Step 2 Why is Sipadan unique? Primarily because it has been protected and the fish, coral and shark populations are healthy. 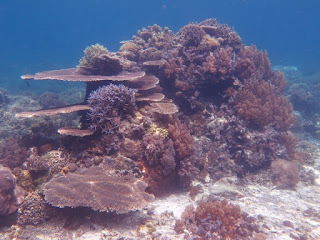 There are beautiful reefs in many places around Semporna, but Sipadan has more big fish and the only abundant sharks. This is not Sipadan! Step 3 What do visitors want to see? Primary attraction is sharks. The bigger the better. 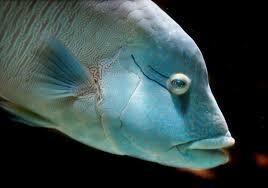 Plus turtles and charismatic big fish such as the humphead wrasse. 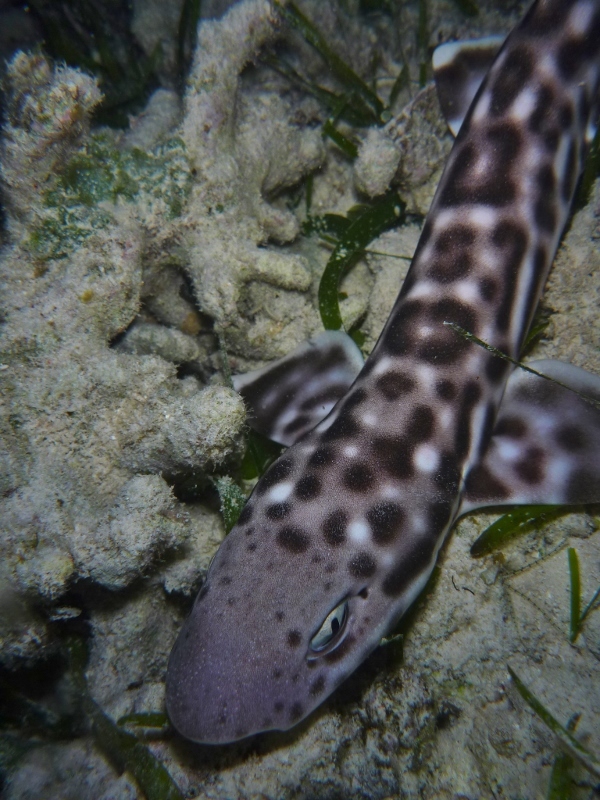 Black tip reef sharks populations can recover BUT only if we stop eating them! Langkayan island in SIMCA is a totally protected area North of Sandakan and has shown that reef recovery is possible. To expand diving tourism and create a 2nd Sipadan we need multiple additional areas where shark populations can recover without conflict with existing villagers. In Sabah with many artisanal fishers, only areas with 100% no fishing can create world class ecotourism sites. Small sites with total protection are better than bigger sites with only partial protection. Artificial reefs like this have been built by resorts to attract marine life. 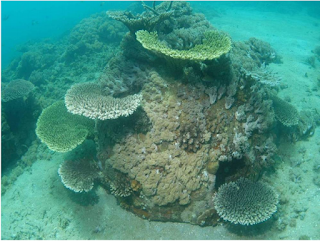 Resorts which are responsible for their own reefs are the best environmental wardens. 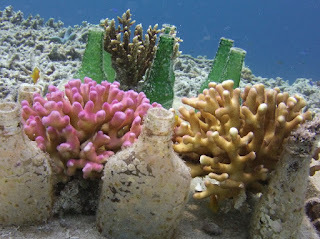 Many resorts in Semporna have invested money in rebuilding reefs for their guests. At the moment these underwater structures are not legally protected. The simplest solution to avoid conflict with local residents in the development of Marine Protected Areas (MPA's) is to learn from the terrestrial parks in Sabah:- Mount Kinabalu, Maliau Basin and Danum Valley were chosen because there were few or no people to create conflict as well as for the amazing biodiversity. Small protected areas close to ecotourism centres are the easiest to enforce. The house reef from each resort can become a small MPA with enforcement by Honorary Wildlife wardens. The Darvel Bay reefs are too difficult to patrol and get limited visitors. The NE Semporna Islands, (Mataking, Pandanan, Timba Timba and Pom Pom Island) and the Roach reefs have no village and few fishermen. Mabul and Ligitan have big village communities with many fishermen. Step 9 Aggregation sites need special protection. 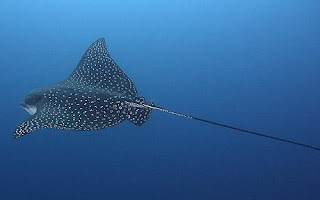 Sites with large populations of fish, sharks, turtles or rays need a localised MPA with regular enforcement and patrols. Sri Amil/Ligitan has unique, WORLD CLASS schools of Mobula Rays, These need focused conservation efforts. 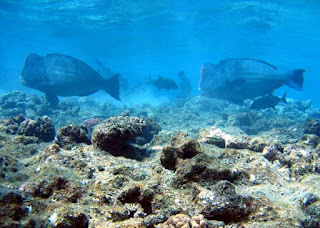 Pom Pom Island has a small population of severely endangered Humphead wrasse. Pom Pom Island, Mataking, Pandanan, Timba Timba have large populations of Turtles using the seagrass beds. Aggregation sites for Mobula rays are a National treasure and should be totally protected. Schools of jacks give photo opportunities at many locations. These are at Mataking island but there is no protection in Sabah for tourist attractions. These proposed Micro MPA will increase biodiversity and allow broodstock fish to develop and breed. The larvae from fish and other species will populate many reefs all over the region. The sites which have no villages will also protect a large number of endangered Turtles. The public awareness program can also show villagers the destruction caused by blast fishing and the reef restoration effort needed to regrow reefs. For very little economic cost, the Semporna district will have a series of improved dive and snorkel sites that will help grow the numbers of tourists visiting. Protecting sharks and rays makes the most sense, A UMS study showed that dead sharks are worth RM5 million to Sabah while live sharks are worth RM200 million. 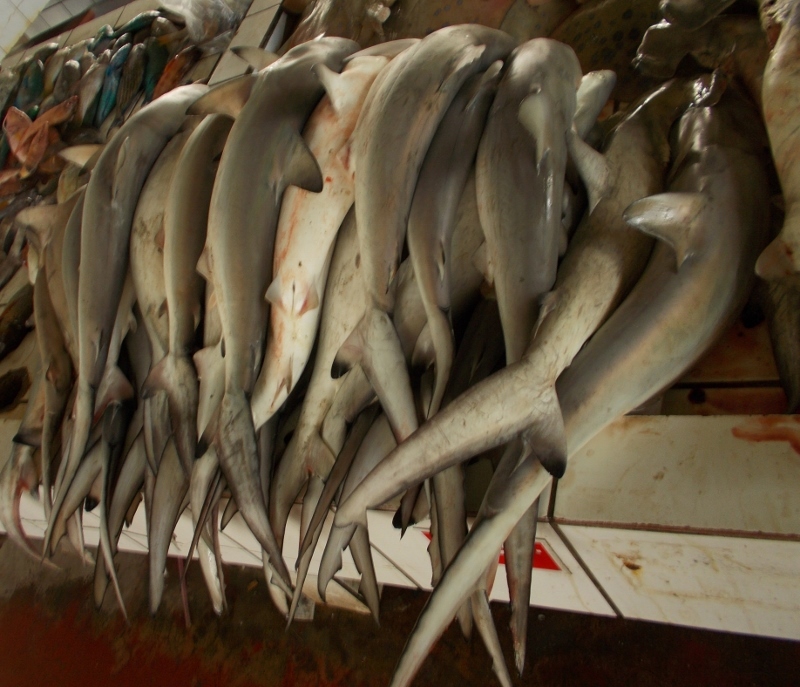 This pile of sharks is worth less than $100 US. Every diver to sabah would pay an additional $100 to be able to dive with sharks!! 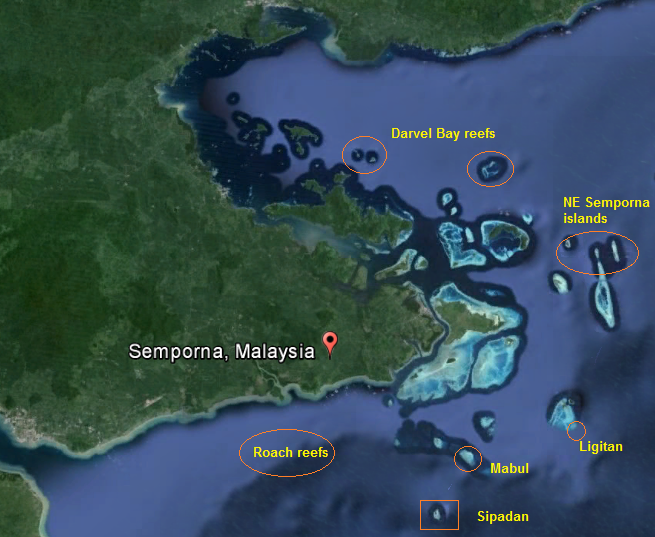 The proposed Micro MPA are a very small proportion of the reef area in Semporna. These areas are very small for healthy big fish populations and tiny for shark areas but they represent a goal which could be achieved. MPA in other areas have shown that if 20% of a reef is protected then there are increased benefits to the other 80% of the reef because of export of adult and juvenile fish. The locations suggested as primary sites for Micro MPA are all chosen because there is no local village. This proposal does not address the multiple user issues on islands with large local villages. Mabul. Kalapuan, Dinawan etc will each need community consultations to achieve different solutions. restore reefs destroyed by blast fishing. The monitoring tasks will change as the reefs start to recover but the following is a summary of the scope of work required to create a Marine Protected Area. Much of this information is available. Biodiversity surveys to identify what species are present in the area. GIS based Habitat survey to map the resources and identify where they are. Identify priority areas and tasks for conservation. Baseline surveys using standardised techniques for monitoring of critical near shore habitats, including mangrove, sea grass and reef communities. Development of a management plan. 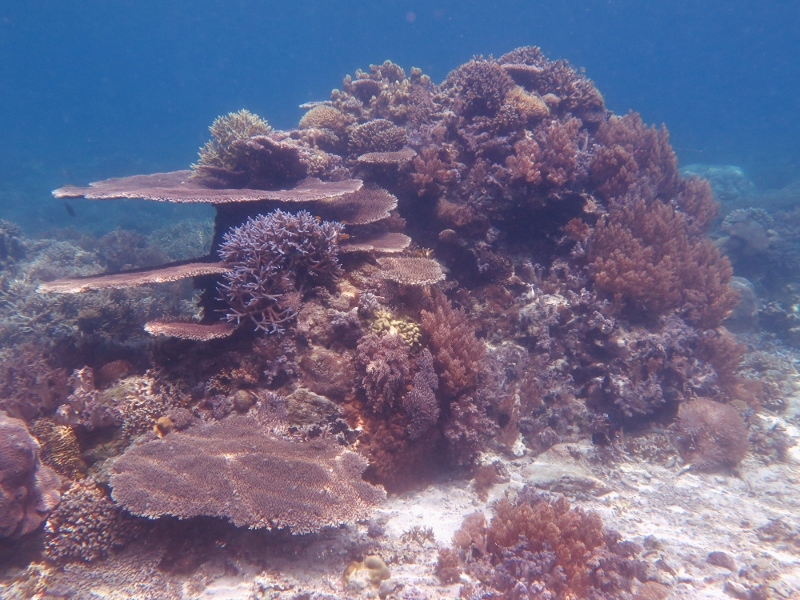 Replant coral onto damaged reefs. Develop reef restoration techniques and assess effectiveness. Clear the beaches of debris to encourage turtle nesting. Monitor and record all instances of nesting and egg laying, turtles, birds, fish, coral etc. Liase with the Wildlife dept. to remove introduced species such as cats to encourage the return of the sea bird populations. removed from the island and determine if re-introductions of rare species is appropriate. Improve awareness of the rich biodiversity within the MPA by taking photos, video and publishing these. Liase with ESSCOM, PGA and wildlife rangers to monitor violations of the MPA. Conduct regular assessments of the effectiveness of the marine protected area. Work with academic institutions to host Train the Trainers courses for future teachers, lecturers and academic mentors. Mentor all volunteers, students and visitors to be environmental ambassadors for marine conservation.